In this picture Vicky magpie has just landed on the branch with some food for the young chicks in her nest. The start of winter, i.e. June is the mating season for magpies. By July the early breeders will have laid their eggs which usually hatch 4 weeks later. The young hatchlings spend a month in the nest developing and growing before they fledge. Vicky is a late breeder. She doesn't lay her eggs until September and it is well into October before we see her fledgelings. 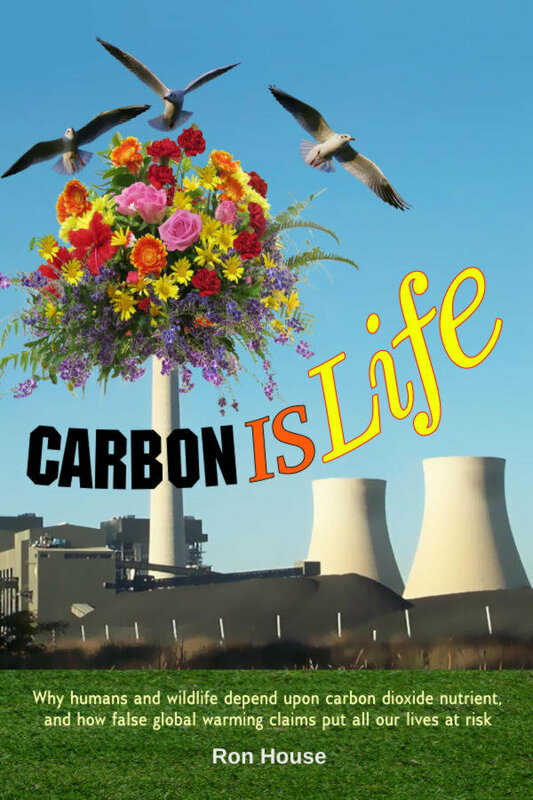 Magpies tend to keep the same nest over the years unless it is destroyed in a storm or other extreme circumstances. But Vicky has changed her nest quite often. For the last two days I've been telling you about noisy-miners. Now the miners are considered to be one of the more aggressive birds in the country. 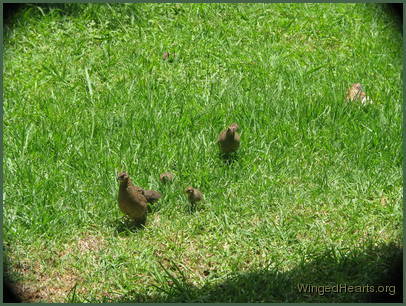 They work in teams and families and can stand up to big birds like the crows and gang up on any bird who won't give into their demands (e.g the friarbirds). Quails on the other hand are considered to be very timid and extremely vulnerable. They have been easy targets for shooters and fall prey to predatory birds. 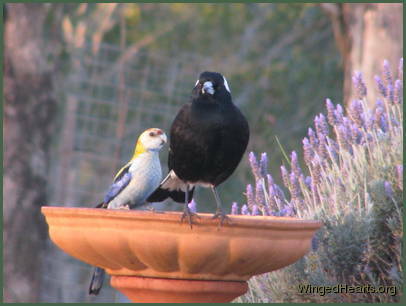 The magpies were the first birds we became friends with, even though they came into yard years after the noisy miners, peewees and pied butcherbirds. 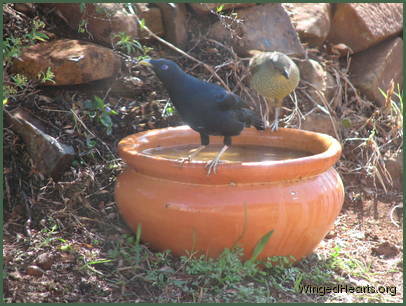 Minnie noisy-miner (left) initiated the friendship. For weeks she had been watching us talk to the magpies. The two species do not eat the same foods. 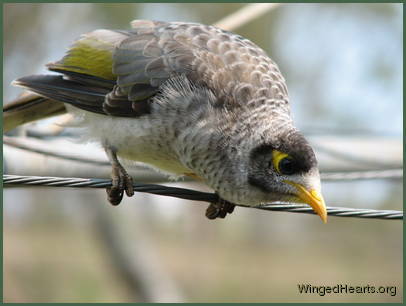 Noisy-miners eat insects and nectar from the plants. They love the grevillea bushes (pictured below with a rainbow lorikeet), (experts liken it to a McDonalds for noisy-miners) and Minnie would spend hours hopping from flower to flower in our backyard. Magpies on the other hand are bug eaters - they like to potter on the ground digging out bugs and worms. They also like a bit of cheese and bread, which should only be given to them in small quantities as a supplement to their natural diet. Communicating successfully with someone from a different species, who is not only not dependent on you, but also flies off in a flash if they don't like the sound of your voice, brings its own suite of challenges. In this series, we look at each of the five major aspects of communicating with wild birds. These involve making them familiar with our speech patterns, listening to learn, understanding our bird's response, building trust, and allowing the friendship to develop. In the previous issue we covered the importance of making the wild birds feel comfortable in your presence, showing them that you care about their welfare and wish to make friends. In this article we look at the art of listening to the birds. Listening is much more than just enjoying their songs. True listening requires us to understand the information they are trying to convey in their language to their family, community, intruders and also their friends which now hopefully includes you.